After cooking dinner for 12 people last night, I decided to take one of my students and go out to dinner tonight. We found our way to a restaurant I have been to many times, and knew that my student liked Thai food so it was a natural. We arrived about 6:50pm on a Saturday night and although the restaurant was not full there was a lot of action taking place. We were “sort of” greeted by the manager and left standing as he sat another patron. After seating them he came back to us and showed us our table. We sat for a few minutes, and one of the female’s that help serve the food brought us water (with lemon slices.) For the first time since I have been dining at Thai Time there was also a small bowl of warm fava beans served as an appetizer. It took another few minutes for them to realize that we were not given menus, and it was rather disconcerting when the manager put them on the end of the table rather than handing each of us our own menu. It was necessary for me to reach across the table to pick up the menu. However, when he came back for our order he was pleasant . 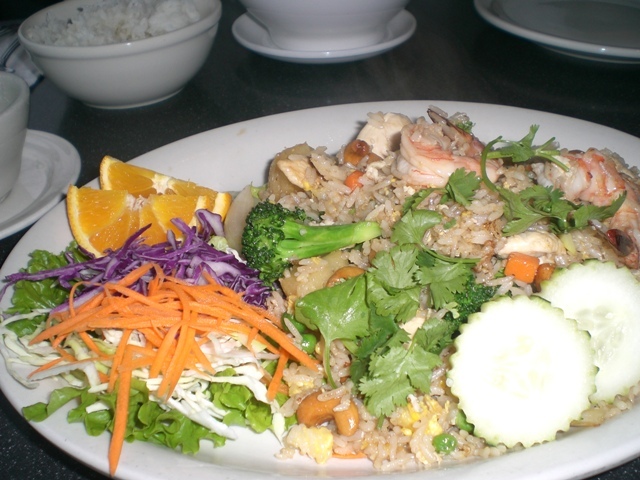 If you have never been to Thai Time before, you might be surprised at the very extensive menu. Each item is numbered, and there are over 75 offerings. The segments are broken down into Appetizers, Soups, Spicy Salads, Thai Noodles and Fried Rice, Entrees, Curries, House Specialties and Seafood, and Thai Time Specialries (sic). Additionally they have 3 varieties of Thai Noodle Soup. The prices are very reasonable, and there are some items that can be ordered as a small or large serving . I ordered “Thai Time Fried Rice” that came with Shrimp, chicken, cashew nuts, pineapple, broccoli, pea and carrot, onion and egg. There were also a few pieces of okra on the plate. The price was also $8.95. Shortly after we were seated a group of 4 came in and were shown to their table. Their drink order was taken and they received their drinks approximately four minutes before my student was served his Sprite. This normally would not be a problem, but since he is from Europe and does not like ice in his water, he would have liked to have his drink sooner. An interesting aspect of the ambiance of the restaurant was that a Billie Holiday tape was playing. It seems to me that in the past there has been Asian music in the background. I enjoyed that music and certainly liked the Billie Holiday music. My student was served his order 3 minutes before mine. The “food runner” brought the rice in a separate bowl from the curry, and an empty place so he could mix them together. My order was served in one large plate, attractive with a multicolored salad, two slices of cucumber and two orange quarters. Both of our meals were hot, and very tasty. This restaurant seems to do a thriving take-out business. While we were there, seven people came in to pick up their called in orders. Additionally, they offer delivery service and we heard the manager make a call to verify the address before sending it out. They also offer a Lunch Special at $6.95 that is quite extensive, listing 23 items. We were pleased with our meal and our service once the order was taken. There is no question that we will be returning. The total meal, with tip, was less than $25. It was certainly worth the price, and quite enjoyable. Suddently I found the service terrible and the food not so good. (Even the green beans were tough…not a cooking error but a purchasing error…I don’t mean they were just crisp…they were old and tough. A friend told me the cook had changed. I tried a couple more times, but wasn’t very happy. So I’ve never gone back. That was quite a while ago, so I’m glad to hear you had a pleasant experience. I’ll try again. I got takeout from Thai Time once and it was absolutely atrocious. My panang curry was even curdled, yuck! I’ve never ordered from them since, and have always opted instead for Meechai (on W Pt Loma) or Supannee House of Thai (on the table tonight!). Given your experience, I might try it again, but after tasting Supannee’s delicacies, I doubt they can be beat! I asked my student what he thought of his red curry and he said he had eaten Thai food downtown the day before and this was a good as that was. I asked him if he thought it was good or just fair; he said good. I then checked with another student that takes out food from there all the time. She said she has never had a bad meal, BUT the manager knows her and she may bet special treatment. Barbara, I did not have anything special, because I knew that I would be giving half of what I ordered to my other student that was at school. I knew she didn’t like spicy food, so I opted for something bland. What I had was tasty. (Of course, I maybe a little skittish after being dunned by eaters that disagreed with my reviews of two restaurants in the past few weeks!) But…I did enjoy what I had. I’m a bit of a Thai snob having grown up in LA, where there are SO many great Thai restaurants. Whilst I have certainly not visited all of them in SD, I of course had to give Thai Time several tries since I live here. All three times I found their food tasteless. That is hard to do with all the wonderful spices Thai food offers. My fave place so far here has been Lotus Thai in Hillcrest. Not sure you could get me back to Thai Time. I have yet to try Meechai as someone mentioned above, but have heard good things from my neighbor. Have heard some good reviews about Sab-E-Lee too. Thai Time in OB is basically a chain restaurant. Last time I ate there I asked them to make my food with the highest spicyness level they got and I barely broke a sweat. I would rate Thai Time as barely average Thai food. The transgender looking servers kind of creep me out too. The best Thai food I’ve had in San Diego is in Hillcrest. Take your pick, they’re all better than Thai Time.